The area has tremendous scope for Orienteering, Hiking, Fishing, Hammocking and Bivvying. Swimming can be done in Lough Key or in nearby Carrick-on-Shannon Indoor Pool and Leisure Centre. Pioneering wood is available on site and with forest surrounding the campsite, firewood is always plentiful. Lough Key Forest and Activity Park (1km) Boda Borg Challenge, Tree Top Canopy Walk, Tunnels, Moylurg Tower, Visitor Centre, Adventure Kingdom, Lough Key Experience. 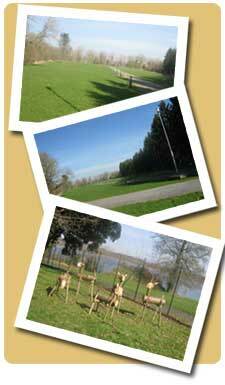 Lough Gara Riding Stables (15km) Horse Riding, Airsoft Shooting, Archery, Falconry and Assault Course. (1km) Tours of Lough Key and rowing boats available for hire. Boats can also be organised for an overnight island survival on request. Carrick-on-Shannon Indoor Swimming Pool and Leisure Centre. King House, Boyle (5km) A magnificently restored early 1700's Georgian Mansion with Galleries and Museum. Carrick Cineplex (12km) 4 screen Cinema offering latest releases. Irish Raptor Research Centre (30km) Get up close to the masters of the sky!